Today I have a wonderful review and swatches of a beautiful holiday collection for you all. When Cassie of Lemming Lacquer e-mailed me, I have to admit, that I didn't know much about her brand. I had seen some swatches around Instagram, but I wasn't very familiar with it. 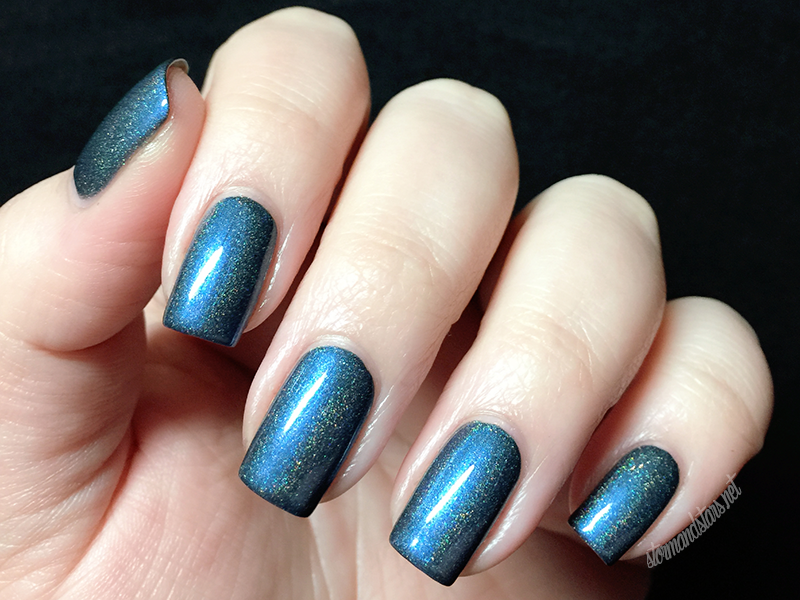 After looking into it and talking to a couple people I decided that it seemed like Lemming Lacquer would be a great fit on my blog so I accepted. Boy am I so glad I did. I absolutely love this collection. Better Watch Out is a holiday collection with a twist. Cassie created a really well thought out collection inspired by the Winter Solstice and old Yuletide stories about dark creatures and sinister figures that came around if children misbehaved. I love this take on the holidays especially since I actually celebrate Yule in my home. I love how unique both the colors and the inspiration for these lacquers are. Now for the photos? Are you ready? First up is one of my favorites (who am I kidding? I loved them all). This is Gryla. I hope I can make up a little for my long absence today with a HUGE post full of beautiful Fall China Glaze lacquers. The Great Outdoors collection has been out for a while, but if you don't already have them they are definitely worth picking up. 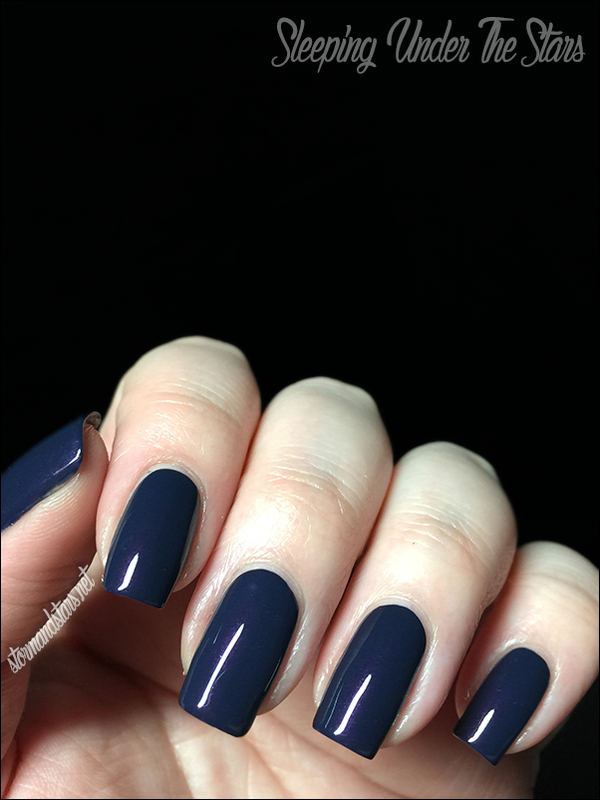 Fall is my favorite time of year and these colors really showcased the kinds of polish I love to wear when it starts getting cold. First up is a beautiful polish called Sleeping Under The Stars. I know I know, it has been an awfully long time. If you follow me on Instagram, you know I've been slightly more active over there, but... my blog fell to the wayside. I'm so sorry. Life sometimes gets in the way of online life and when you're also dealing with personal issues, everything compounds. I do my best to be active here, but unfortunately sometimes my life gets to where I have to make myself the most important person. I've had some of those moments over the last few months and I had to make the decision to step away until I was able to come back. If you've been following me for a while you know that I am not shy about the fact that I have major depression and anxiety disorder. I've been struggling with both lately and I had to make the decision that I was more important than my blog or my shop or whatever else was going on with my online life. I'm playing catch up now, but while I was away I came to an important decision. This blog was started as somewhere I could share more about my nails and my art. It was somewhere that I could post reviews of colors I loved and post lots of photos of nail art I did. Somewhere along the way it stopped being my soapbox and became a place of stress and anxiety for me. My posts went from excited to business. I stopped doing nail art and spend countless hours painting my nails then taking it off and painting my nails then taking it off. It's gotten tiring. Now don't get me wrong... I love polish and it is a big part of my life still. I don't mind taking a review job here and there, but it has to be a brand I love. It has to be a brand like Sweet Baby by Donna, Nvr Enuff Polish or Doctor Lacquer, where I really stand behind them and their brand. I don't want to get burnt out again, and for the most part, I'll be posting only on my Instagram. I'm going to be trying to get one post up here every other week to start, whether it is nail art or a review. One last thing, I have a few reviews that have been mostly done for ages now, but haven't been posted. I'm going to start posting them the next couple days since they're so late, but I hope you enjoy. Day 4 of the 31 Day Challenge is Green! If you don't know what the 31 Day Nail Art Challenge is you can head over to the FAQ over at Chalkboard Nails. She does a great job explaining everything. Also, make sure you're following along with the hashtag #31DC2015 on social media (especially Instagram) to see what everyone else is doing for the prompts. I had the hardest time deciding on a design for green. I had about 5 ideas and I tried three of them before finally deciding to just start with a gradient and see what it inspired. It turns out that it reminded me of a background in a beautiful piece of jewelry I saw on Pinterest, so I decided to recreate something similar on my nails. 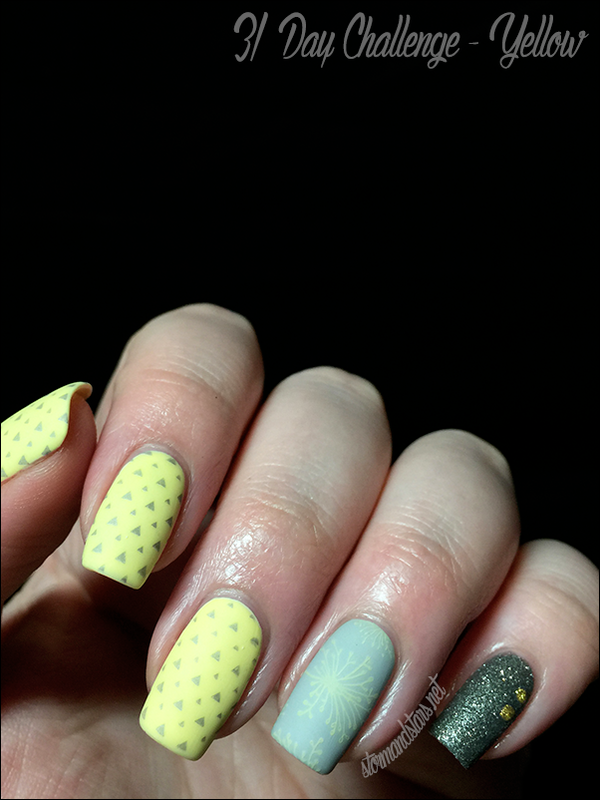 I did a combo of freehand and stamping that I think captures it pretty well. I think it captures the essence of the piece very well! 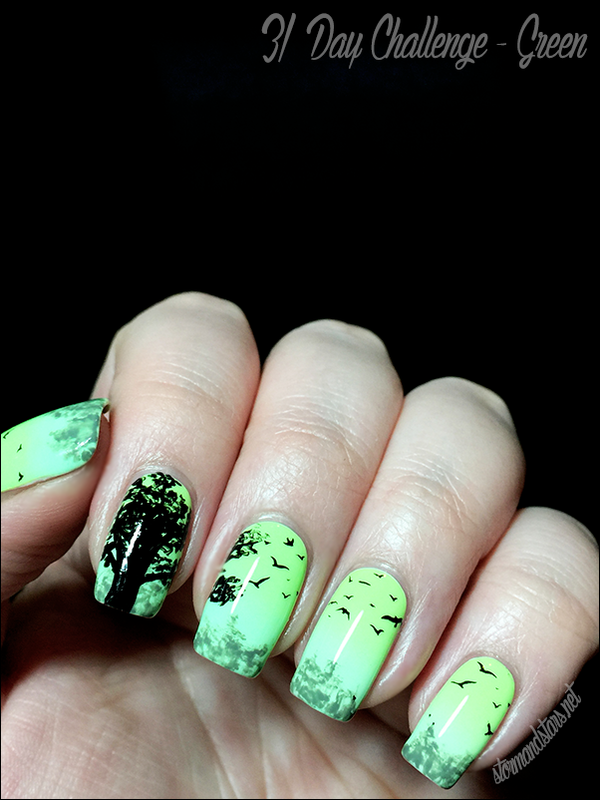 I started with a gradient using Black Luna Lacquer Cat Eyes and China Glaze The Grass Is Lime Greener. I loved this combo of greens and although it seems like my bottle of Cat Eyes doesn't really glow anymore, it couldn't be happier with how the gradient looks in the light. Day 3 of the 31 Day Challenge is Yellow! If you don't know what the 31 Day Nail Art Challenge is you can head over to the FAQ over at Chalkboard Nails. She does a great job explaining everything. Now, how about something softer for the yellow prompt? I had planned on a neon manicure for this prompt, but then I was looking through my plates and fell in love with this simple image with the triangles and I knew I needed something softer.